To be effective the association must have both a representative membership base and also the funds to fulfil the vision and direction provided by the board. There is little point in running an association that either prices itself out of its market or does not have the buy-in of the wider industry at large. The proposed fee structure is to be based upon the Class and category of membership. Annual membership fees range from as low as $250 for a small individual domain owner doing less than $10K in sales per year up to $25K for a large company doing in excess of $5m in revenue. By having the annual fees linked to a Class and category (eg. A, B or C) of membership means that the association is affordable to the broad spectrum of the industry. From the previous article I indicated that the members within each of the categories can also nominate for board election to represent their constituency. There are four major areas of the cashflow. 1. Drivers – new members and total number of members. 2. Income from membership fees – other potential incomes have been ignored. 3. Expenses - what it will cost to run a lean business with a reasonable CEO package. 4. Profit and cashflow – results if the targets specified from the above are met. 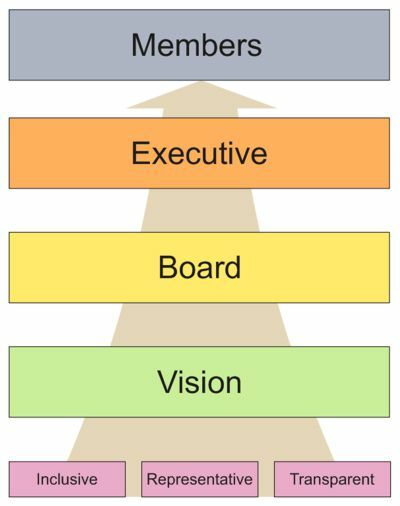 The drivers outline the targets that the new CEO and board for that matter need to reach in terms of new members by category. After the initial push of gaining 41 members a typical month will mean 10 new members each month for the following 12 months. This will provide near enough to 150 members in the association by the end of 12 months. This does not count the “free” members from the “general user” category that would essentially sign-up for a newsletter. The above drivers and fees then translate through to the income line of the association. Finally, the expense are calculated and a monthly profit and cashflow is derived. As can be seen from the cashflow the lowest point is around $90K positive and by the end of the 12 months there should be near enough to $120K in the bank. The total revenue for the association is $406K with $287K in expenses. This will fund a CEO and membership assistant plus allow ample funds for marketing and traveling to the various conferences around the world. It also allows a not insignificant amount of money for consultants (eg. legal advice, lobbying etc.). The association will not have an office....I really don't think that it needs one. This avoids a lot of fixed costs and overheads. So is it financially feasible to build an association based upon these numbers? Although more work may need to be done on the financial model I believe that it does indicate that our industry can support a thriving association. It really comes back to whether the wider community buys into the vision and principles outlined in the initial articles in this series. 1. Having a working board – there is absolutely no point in having directors that turn up and haven’t given any thought to the association since the last board meeting. Board members need to be harnessed and put to work for the people that voted them into that position. 2. Sourcing the right CEO – There are a lot of skills that this person will need to have. Corporate governance, team building, political savvy, respect of the industry and of course an ability to inspire others to join the association. If the wrong CEO is selected then I think that trying to meet the targets will fall largely on the directors…..this may be quite hard. I know that this article has skirted a number of issues but I believe that it provides the bones from which a good discussion can be had to add the flesh. So please don’t be shy! I’d love any suggestions that you may have and how the association can be given new life and vitality. Michael Gilmour has been in business for over 32 years and has both a BSC in Electronics and Computer Science and an MBA. He is the former vice-chairman of the Internet Industry Association in Australia and is in demand as a speaker at Internet conferences the world over. Michael is passionate about working with online entrepreneurs to help them navigate their new ventures around the many pitfalls that all businesses face. Over the years I’ve seen many organisations get confused over the rolls of the CEO, treasurer and chairman. Chairmen often try and be the CEO and treasurers try and control the association via the budget. The facts are that each of the rolls are critical to the success of the association as long as those people in the positions clearly understands their tasks. 1. Has a casting vote in the board meeting in the event of a tied vote. 2. Represents the association at events where the membership is present (eg. AGM). 3. The most critical role is often to provide support for the CEO and help navigate any internal or external political issues so that the job of the association can get done. In my time as the vice-chairmen of the Australian Internet Industry Association I often found myself talking to the CEO and providing another perspective in deliberations. This then sometimes came to offering personal support as the role of the CEO can be personally taxing. To this day I have a great friendship with the former CEO and a huge amount of respect for what he helped accomplish during his tenure. This is often a thankless task but one that is vital to get in the hands of a competent person. People often think that the treasurer’s job is to “do the financial books”. In some cases this may be true but it’s often better that a book-keeper actually prepares the finances and reports back to the treasurer. The treasurer can then report on the financial position of the association to the board and to the members at the AGM. In my experience as a treasurer I found it useful to establish a finance committee where the CEO, two other board members and I were in attendance. We met on a phone call once per month to review the figures and to ensure that they were within expectations. I would work with the CEO to establish annual budgets to meet the association’s requirements and the goals of the board. This budget would be submitted to a finance committee meeting and then to the following board meeting for approval. Everything was then measured against the budget. I should mention that when I first stepped into the treasurer’s role I had inherited a bit of a disaster and some tough calls had to be made (eg. Cutting the salary of the CEO). When I handed the position onto my successor I was quite proud that the CEO had been reimbursed his reduced salary and there was over $250K in the bank. It really wasn’t rocket science….just prudent financial management. Sadly, I’ve often found that chief executives make reference to their board in a less than friendly manner. This is a shame as a strong association is often the result of a strong board that has a productive relationship with the CEO. Generally speaking the CEO of the association should be fulfilling the policies of the board. 1. A bridge between the membership and the board. 2. Represents the association to other organisations. 3. Ensures that board policies are acted upon in a practical manner. In my opinion the CEO should always be on the board to help avoid any miscommunications. What I found worked really well was the establishment of taskforces that were centred on particular issues. A director or member would chair the task force and interested members could then join in to add their own contribution. Task forces would only be formed while the issue they were addressing was pertinent. For example, I chaired the online advertising standards task force. At the time, there weren’t any standards and advertisers had no idea what a view, click or a CPM really was. This reduced the amount of money that they were prepared to spend in online advertising. I’ll never forget trying to “herd the cats” of advertising agencies that were building various technologies to generate metrics for their clients. Each of them thought that their own methods were the best. In the end they saw the sense in a universal standard. The result was the online advertising industry grew by an order of magnitude. Another taskforce had to do with cyber-crime. The CEO of one of the major ISPs chaired the taskforce and worked with government, authorities and other competitors to work at reducing online criminal activities. Taskforces are a way for the membership to get involved in their association that is WAY beyond just paying the membership fees. Since there is feedback up and back from the board then a taskforce could be formed or even be disbanded very quickly. It also meant that the CEO became more of a coordinator rather than a doer that is being run ragged. When I reflect on the domain industry there are a number of taskforces that really need to be established. 1. Net neutrality and the impact upon domains. I’m sure that any of you reading this could add a few more to the list. What’s important is that they are issues that you are passionate about that need buy-in from some members to be a part of the taskforce and approval by the board. You can’t have people wanting to create completely random taskforces! As per usual, I look forward to your feedback and constructive comments. This is the second in a multi-part series on how I would approach the establishment of a Domain Name Association. I must say that the feedback has been fantastic to date and that the discussion has been really valuable. I would encourage everyone to take part in the discussion. The role of the board is to monitor the progress of the association so that it is in line with the guiding principles and vision. The following diagram illustrates the position of the board with respect to the principles and membership. 1. Financial prudence and good governance to ensure that the organisation is solvent. 2. Fulfilling the vision via policies that benefit the different membership classes (more on this later). Members of the board may be part of a subcommittee that is involved in management tasks but when they report back to the board they need to act as directors. In board meetings all directors of the association have a fiduciary responsibility to leave their external objectives (ie. personal and possible employer) and to work for the betterment of the association. This means that at times individuals may find themselves in a conflict of objectives. If this is the case the director will need to notify the board of a possible conflict and have it minuted that they have excused themselves from future deliberations on that particular issue. Typically, this will also involve the individual leaving the board meeting physical for a short time. Issues such as the one above will need to be addressed as a part of the code of conduct that each and every director would need to sign prior to becoming a director. Other than the CEO all board positions are for a maximum term of 2 years. Any director can serve for a maximum of 3 consecutive terms (ie. a total of 6 years) prior to having to rotate off the board. After being off the board for a term they may then offer their candidacy for election. This will then force a rotation in the board and ensure that fresh ideas are constantly being brought forward by new directors. The board may initially be formed with a cascading terms (ie. some positions deemed as being already served for 1,2 or 3 terms) so that all elections for all board positions do not fall at the same time. 1. Election in a particular category class. 2. Appointment by the board to assist in its proper functioning. Under the guidance of the three overarching principles of inclusive, representative and transparent I would suggest the following structure for a fully functioning board. The category and classes of available board seats are derived from the various “freedoms” that are core to the vision outlined in part 1 of the series. Members that can possibly be in multiple classes must choose which class they represent at the time of becoming a member. This means that members can ONLY represent a single class. Members with multiple associated organisations may only represent one class. For example, if a member is a part of a group of companies that has both a parking company and a registrar then they must choose which class that they represent. This is to avoid any individual company potentially seizing multiple board seats with different affiliated companies. To be geographically inclusive there needs to be at least three continents represented on the board. If there isn’t then the board can use one of its two reserved seats and appoint a director from a region to fulfill this objective. The classes of A, B and C represents bands of size (by revenue). For example, there may be 5 domain investor members that qualify for the class A director seat. Any of these member may offer themselves up for their class’s board seat. If there is more than one member offering their services to the association for a single position then the other members in that class may vote whom they would like to represent their class on the board. In the event that there is a tie the current board chairmen has a casting vote to break the deadlock. No board seat is automatically awarded to any member that “pays” for the position. All members are treated equally in their class and all directors have equal voting rights within the board itself. This structure for the board will mean that it is inclusive, representative and transparent. All members will have an opportunity to become a director, represent their membership class and elections will be transparent and open. This would then satisfy the guiding principles of the association. I would like to make it clear that these are my thoughts on how I believe that a domain association could be established. This is not meant to be disparaging against any existing associations in anyway whatsoever (eg. ICA, thedna.org etc.). I’m sure that this article will provoke a great deal of thought and hopefully comment. It is my belief that it’s through open discussion that a better outcome can be achieved. Over the last few months I’ve been doing a lot of thinking on the topic of establishing a domain industry association for everyone. The domain industry is being rocked by forces that as individuals we have little control over but as a corporate body we could directly influence. I welcome any and all feedback on the topic as I personally believe that it is critical that we work together to achieve a better outcome for us all. I should also state up front that I don’t believe that I have all of the answers but that I am prepared to kick the ball into play. The association should embrace all stakeholders from within the domain industry. Everyone from the end-user wishing to protect their intellectual property rights through to registries, registrars and monetisation partners. Policies ratified by the board need to be for the betterment of the future of the majority of the stakeholders – note that this doesn’t necessary mean all stakeholders. Being inclusive also means that the association must be truly global. Although the USA founded the Internet, amidst the pressures of the cold war, it has now become a global utility for all of humanity. The structure and foundation of the association needs to reflect this migration. As much as the association is inclusive it must also be representative. This means that the board must reflect all the stakeholders from all the geographic regions and not just the members with the biggest pockets. A truly representative board would reflect the structure of the membership and also be a hotbed of innovation solutions to what are sometimes intractable problems. A lot more on the board later. One of the major problems with the domain industry is the lack of transparency. The association needs to be transparent in the manner in which it operates and as a matter of policy work with the key stakeholders to help change the way the industry behaves so that the industry can grow. Freedom to go where I want. Do you realise that apps create a walled garden etc. Freedom to build my investment portfolio. I should be able to invest where I want to invest. Freedom to have domains used. User’s should be able to stake their plot of land on the Internet with a domain name. Freedom to sell direct navigation. Investors should be able to sell their domain traffic to whomever they please. I should be able to sell or buy a domain if I want to. A key word in the vision is innovation. One of the many problems in the domain monetisation industry is that Google has sought to block innovation through legal means, ultimately control of the pages themselves and a lack of transparency of payments. The stifling of innovative approaches to monetisation needs to be urgently addressed. I initially had the word business rather than destination but I believe that the internet is bigger than business. It’s about places that people want to find and explore. It’s about people that help other people and where everyone can have a voice….therefore they are destinations. As I said in the introductory article, this will be a series that I hope provokes a lot of discussion….so feel free to contribute! With the all-pervasive hysteria about the new gTLDs I feel like I’m going a bit against the flow. So why aren’t I getting into a buying frenzy and forking out wads of cash? In a previous blog I talked about having a business model for each domain name that I own, the problem is I can’t see a business model with the new gTLDs. Let’s just think about it for a second; they won’t have any traffic, with the glut of opportunities available they won’t really be that sellable and I don’t need another domain to build into business (I’ve got enough to last a lifetime!). Hmmm…..so what is the business model? How am I going to get my return on my investment? I’m not…plain and simple. On top of there not being a business model I find that it’s also all about focus. Since 2014 started ParkLogic is has been going through a massive growth spurt and we’re in the middle of a major developmental project. We hope to have this ready for release at DomainFest at the end of March. I don’t want to lose my focus from ParkLogic on something that is more of a gamble playing the lottery. 1. What is my return on my investment? 2. When will this happen? If you can’t ask these questions then I suggest that you attend TRAFFIC in Las Vegas and put your money on the roulette wheel. At least you may have some fun!